Fatima Arceo was born with spina bifida, and abandoned at birth on September 29th, 2006. In her short six (6) years of life, she has had ten shunt revisions and five operations, and has many more procedures to undergo. In particular, she is expected to undergo an MRI to investigate whether Fatima can receive corrective surgery to enable her to eventually walk. She is a beautiful, happy soul, constantly smiling and despite being in a wheelchair most of her life, enjoys music and dancing, not letting a set of wheels get in her way of a good time. Everyone who meets Fatima instantly falls in love with her, taken in by her glowing smile and general cheerful attitude. One person who was touched by this little girl was photographer Olivera “Oli” Rusu, and she is offering a special photo session to help raise some much needed funds for the upcoming procedures that Fatima must undergo. 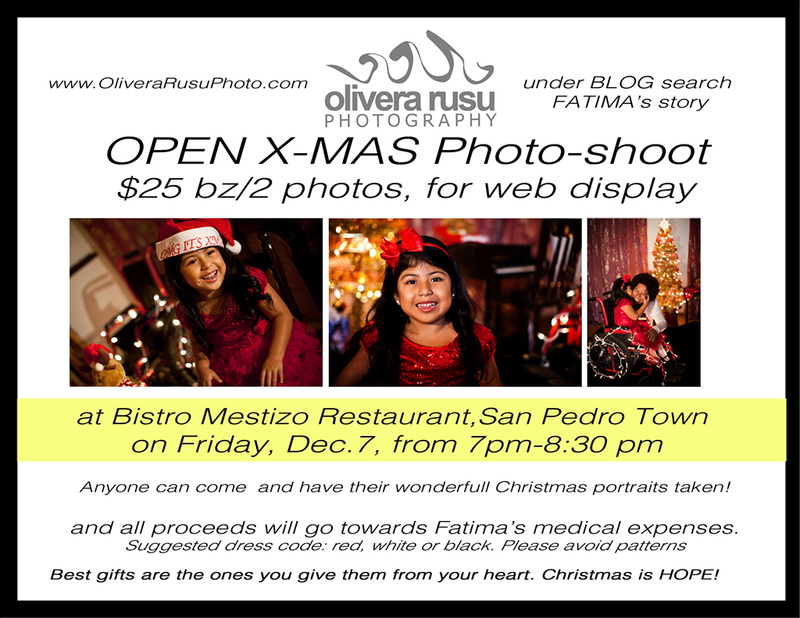 On Friday, December 7th starting at 7PM, Oli will be doing a Christmas photo shoot at Bistro Mestizo Restaurant. For $25BZ, you get two (2) photographs for web display. For the best photos, Oli recommends solid colors such as white, red, or green, even black. Get your Christmas portraits while helping a lovely young girl with her medical expenses. There will be specials at Bistro as well, so don’t miss out! See you there! !